Bi-Curious George and Other Side Kicks, Watch Out Festival, Cambridge. Forty or so adults are writhing in their seats watching Professor Addrian -a Punch and Judy expert – blow up a balloon. This is because he is definitely, absolutely going to pop it. He’s blowing it up too big. It’s making scraping, squeaking noises. Addrian is blowing up a balloon and it’s completely anarchic and dangerous, and there are people turned away from the stage, with their fingers in their ears. It’s that unbearable. We would be eating out of the palm of his hand, if only he’d let go of the balloon. No wonder his daughter, live artist Lucy Hutson, has to introduce Bi-Curious George and Other Side Kicks as MY show. They express this ownership conflict via a series of costumes and abstractions. The show moves from smacking its audience round the face with gimmicks and balloons to subtle and dense symbolism. Lucy and Addrian use puppets to discuss their shared history. Lucy’s puppet is totally disjointed from herself. It’s brightly coloured, perched at the end of her wrist. Addrian’s puppet is like a continuation of himself – sat on his knee, it merges into his body like a Siamese twin. Lucy is less vulnerable than him on stage – she uses the puppet to talk, he needs his. It feels like he’s been using his for a while. This conflict – whose show is it anyway? – is at its funniest when Addrian’s post-colonial analysis of Curious George is interrupted by Lucy, as Curious George, clambering over the audience, stealing their sunglasses. I’m beaming when I get my hug. It’s a shame that this segment isn’t formally choreographed, though. There are some trips and spills that lead to the audience having to help Lucy make her way through the seats. They stop being enraptured kids and start being conscientious theatre-goers. There are, however, plenty of other places where Lucy and Addrian are totally in control of the audience’s glee. They exploit and examine how children’s performances flip between whimsy and violence: they are making balloon aliens holding flowers, but in a race that could pop the balloons at any second. Look at Curious George the monkey! Look at him beat Mr Punch to death! Lucy, as Curious George, is beating her Dad, as Mr Punch, to death. Each thwack makes a super satisfying noise. “Why does my dad like you so much?” she asks. It’s intimate without being tender and soft. It’s a new, funny, cross intimacy that I could recognise as intrinsic to how I – and perhaps all of us – feel about family. Professor Addrian risks this built intimacy. He lacks his daughter’s ability to look inward without looking away from the audience. He accuses the audience of voyeurism, saying he finds it distasteful. I feel like I’ve missed a layer, something to justify the artist spitting on my presence there. I couldn’t find it. The constant making of balloon objects on stage alludes to artistic process without Addrian needing to say it. The hokey little magic tricks that sometimes go wrong remind us of the knife-edge of performance without the performer needing to explain their fear to the audience. The ending is a little scruffy, because it’s not clear if they are ending the final magic trick, or the whole show. It’s both. The symbols are so strong that it almost doesn’t matter, though. We are all always sawn in half by our parents, cut into who we were to them and who we are now. And what father hasn’t wished to put his sundered daughter back together with magic words, and found this an impossibility. 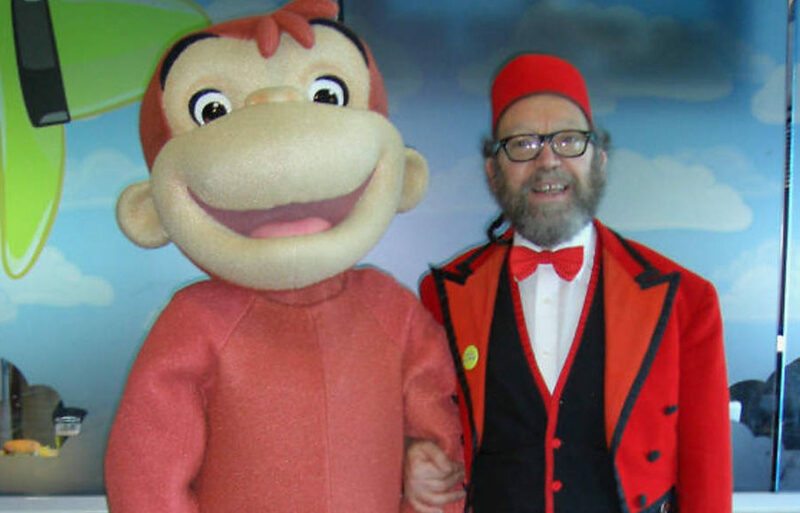 Bi-Curious George and Other Side Kicks is currently touring the UK. For future dates, and more details, click here.